This Cherry switch has been manufactured to give rugged performance. Cherry DB2C-A1A Micro Switch. During that process you will be issued with an RMA number. Cherry DB1C-A1RC. During that process you will be issued with an RMA number. Microswitch snap action is retained whilst providing increased protection against flashover. Cherry Standard 3mm Gap. UL /C-UL recognised; ENEC. Cherry DB1C-A1AA Microswitch SPDT 6A 250V AC, Button, Solder. Cherry DB1C-A1A. During that process you will be issued with an RMA number. A high quality precision Cherry microswitch that satisfies industries including automotive, white goods, security, vending and office automation. The switch has been manufactured to give rugged performance. 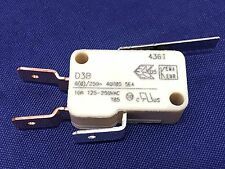 This DG13-B1LA sub-subminiature microswitch from Cherry is suitable for many industry applications. Cherry DB3C-B1AA Microswitch SPDT 0.1A 250V AC, Button, Q.C. This Cherry switch has been manufactured to give rugged performance. Cherry DB3C-B1A Micro Switch. 1 changeover. Cherry KWHC Microswitch Micro Switch 5A 125 / 250VAC 1/4 HP SPDT USA Seller !! Manufacturer: Cherry Manufacturers Part #s: KWHC0001. Cherry D453-V1AA Microswitch SPDT 16A Std. Force, Button, Q.C. Straight. Cherry D453-V1A. Cherry DH2C-C5PA ultraminiature microswitch, suitable for applications up to 30V DC. 5 to 500mA at 30V DC. Lever; Application: DC series. Type of switch accessories lever. Application DC series. Cherry DB3C-B1RC Microswitch SPDT 0.1A 250V AC, Medium Roller, Q.C. This Cherry switch has been manufactured to give rugged performance. Cherry DB3C-B1RC Micro Switch. During that process you will be issued with an RMA number. RoHS compliant. Cherry DB1C-B1LD Microswitch SPDT 6A 250V AC, Long Lever, Q.C. Type of switch microswitch SNAP ACTION. Switches features without lever. Electrical life 50000cycles. This Cherry switch has been manufactured to give rugged performance. Cherry DB3C-A1LC Micro Switch. During that process you will be issued with an RMA number. RoHS compliant. 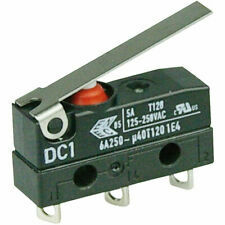 Cherry D413-V3AA Microswitch SPDT 0.1A Std. Force, Button, Q.C. Dog-leg. Cherry D413-V3A. Cherry 6141234 auxiliary actuator. The DC Series of subminiature sealed snap action switches are manufactured to the highest standards for quality, reliability and durability. Length 57mm. During that process you will be issued with an RMA number. Cherry GPTCRR01 micro switch. A single pole double throw micro switch. 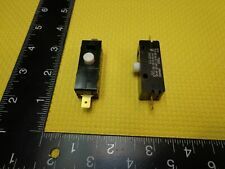 Cherry 7140262 auxiliary actuator. The DC Series of subminiature sealed snap action switches are manufactured to the highest standards for quality, reliability and durability. During that process you will be issued with an RMA number. 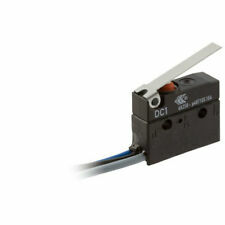 This DG13-B3LA sub-subminiature microswitch from Cherry is suitable for many industry applications. Type of switch microswitch SNAP ACTION. Switches features without lever. Electrical life 10000cycles. Cherry 7140260 auxiliary actuator. The DC Series of subminiature sealed snap action switches are manufactured to the highest standards for quality, reliability and durability. 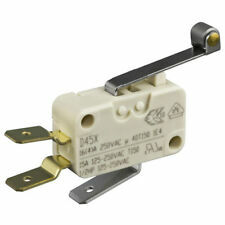 Microswitch SNAP ACTION; SPDT; 10A/250VAC; ON-(ON); Positions:2. Type of switch microswitch SNAP ACTION. Number of positions 2. Stable positions number 1-position. This Cherry switch has been manufactured to give rugged performance. Cherry DB2C-A1LB Micro Switch. This Cherry switch has been manufactured to give rugged performance. Cherry DB2C-C1LB Micro Switch.